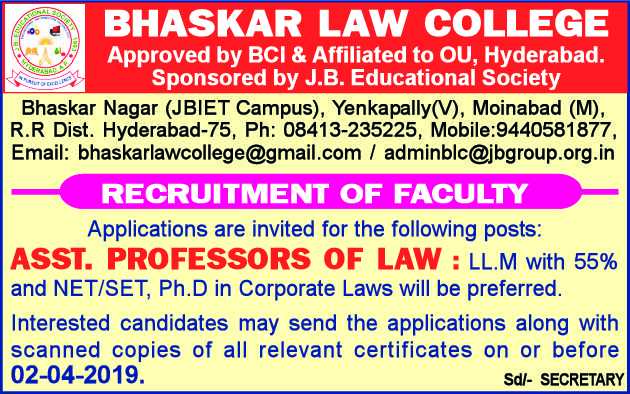 Bhaskar Law College, Hyderabad has advertised for recruitment of Teaching Faculty- Assistant Professor jobs vacancies. Interested and eligible job aspirants are requested to apply on or before 02nd April 2019. Check out further more details below. About College: An admiration in the field of legal Education, Bhaskar Law College, a part of the visionary Late. Sri J.Bhaskaro Rao’s accomplishment, observed its inception in the year 2008 with the lofty aim of providing quality professional education and meeting the rising expectations of the student community in Telangana & than Andhra Pradesh. J.B.Educational Society has been working relentlessly towards the objective of achieving excellence in the fields of Engineering, Medicine, Management, Hospitality and Information Technology. LLM with 55% of marks and NET / SET / Ph.D in corporate laws will be preferred.